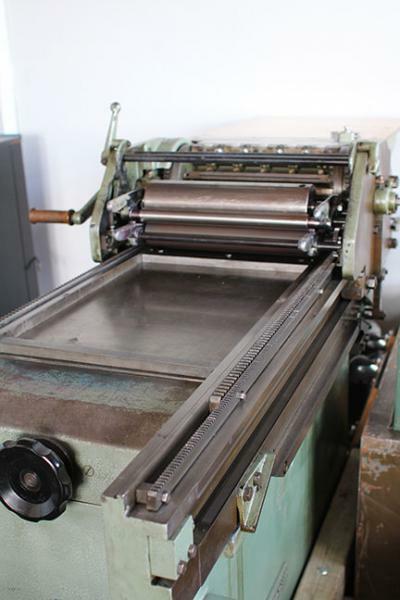 Letterpress printing/bookbinding equipment to sell. Purchased most of this in the last 4-5 years but now I’m moving out of state and soon plan on doing some long term international travel. As we all know this isn’t a very portable hobby. Hoping to find these items new homes where they will be loved and cared for and used to make fantastic paper goods. All items are located in a garage so easy access for moving. I’m happy to send pictures of any items not pictured here. Buyer responsible for shipping. No it isn’t a Vandercook but it prints just as well as all the Vandercooks I’ve printed on (Uni I, #4, Uni 3, Sp-15) and you won’t have to drop 12+k to own it. C’mon be a rebel and go with a non-vandy. Have a few related misc items to throw in as well such as palette knives and a roller height gauge. 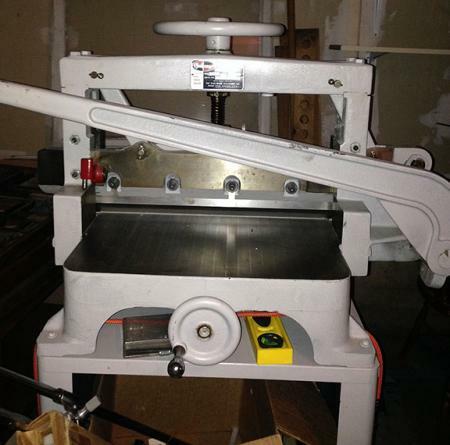 This press was purchased from, and fully refurbished by, Don Black around 4 years ago. 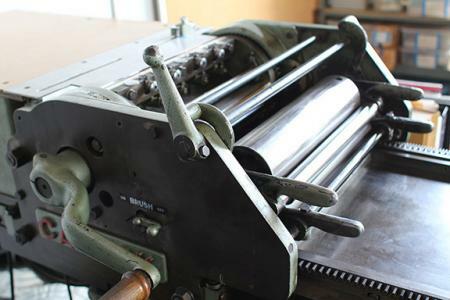 Press is similar to a Vandercook Universal 1 or a #4. Press does have an adjustable bed. It is in great shape and prints quite nicely. 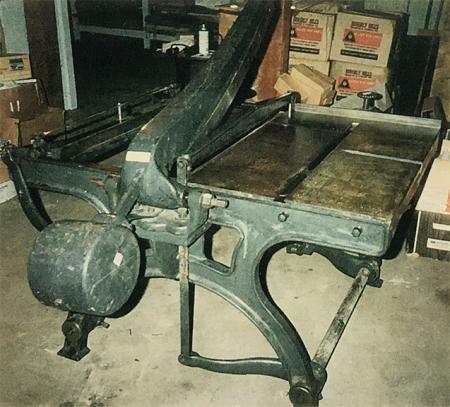 I have only used the press to print lead and wood type. If I weren’t planning on traveling for an extensive amount of time I’d never part with it. I can recommend some highly trusted riggers here in Portland if you need some trustworthy folks to help you move this beautiful beast. Has 100 galleys, some are quite rusted but some aren’t so much, think this is what antique dealers refer to as “patina”. Cabinet is on sturdy wheels so it can be moved around if need be. Purchased from a business that was closing. Used continuously by them and was well taken care of. Safety works well so you can keep all your digits intact, seriously those blades are sharp. On stand and comes with an extra blade and box of cutting sticks. Blade on machine has lots of life in it and I believe the extra blade is sharp and ready to go but can’t quite recall as I don’t use it too frequently. I can recommend a great place here in Portland to get it sharpened if need be. I haven’t bothered to measure this yet because I’ve been a bit busy packing up my whole life but this rack is about waist high and would easily fit under a press feedboard. Best guess is that each surface is around 11 x 14. I can measure it if you have space concerns but this is a relatively small drying rack so good for small shops. Purchased new a few years ago and I’ve been vigilant about keeping it out of direct light. Condition is excellent, as nice of one as if you brought it brand new. Oil based printing inks, haven’t set a price, email offer for inks. Ink from Ink in Tubes and comes in the following colors, many of which are almost completely full—black, white, silver, green, violet, reflex blue, process blue, warm red, rubine red, rhodamine red. yellow. Good set for someone with a small press or someone who doesn’t print frequently. Have large 5 lb cans of ink. Red, Black, Green, and Cyan I believe. 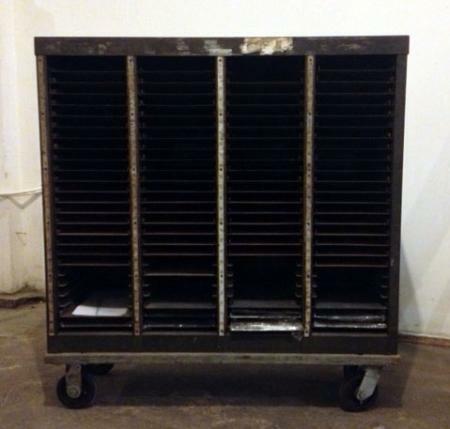 Also industrial style shelving, with adjustable shelves, large flat file (41 x 54), and misc reams of 8 ½ x 11 paper such as Mohawk Via, Neenah Classic Crest, and Wausau exact opaque colors. Some misc sheets (mostly full sized) of a variety of printmaking papers. Make offer on shelving, paper, and inks, all money earned from sale of any of the above items will help support me in my travels. Please email if you have questions or need photos of items.